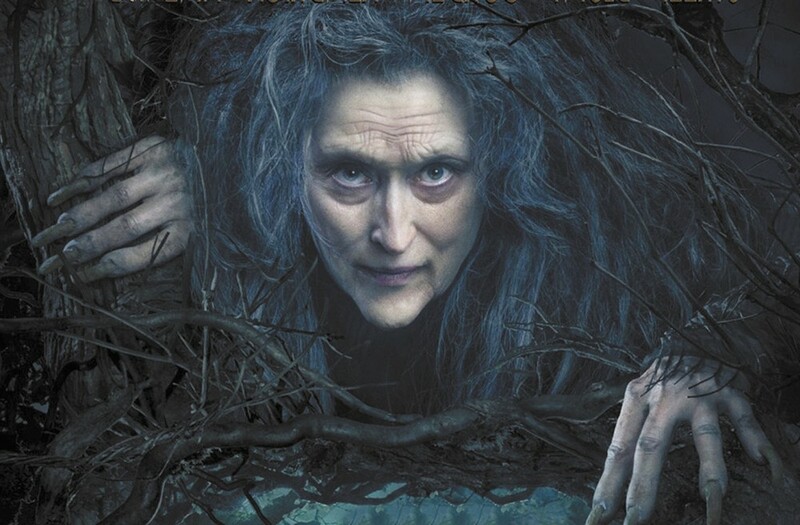 Meryl Streep is part of Into the Woods' star-studded cast. I can't recall the last time a film I enjoyed as much as this one also infuriated me. Watching it was the best part: Terrific acting and singing, Oscar-worthy costumes and production design, a wholly imaginative transformation of very familiar stories into something new. The smash stage play, written by James Lapine, and with songs by Lapine and Stephen Sondheim, took a batch of Grimm fairy tales — say hello to Cinderella, Little Red Riding Hood, Rapunzel, and Jack (of beanstalk fame) — introduced an original story about a baker and his wife who want only to have a baby, then mashed them all up into something new. There's a witch, you see, marvelously overacted by Meryl Streep, who has cursed the baker and his wife with infertility, but will reverse it if they procure for her: a white cow (Jack has one), a red cape (Red is wearing one), a gold slipper (yeah, Cinderella's shoe was made of glass; just deal with it), and some yellow hair (look, up in the tower, it's Rapunzel). It all sounds good, like, as the Disney trailers joyfully suggest, it's the perfect film to see with your family. Sorry, but those trailers are misleading, as is the PG rating that the Motion Picture Association of America has irresponsibly assigned to the film. Hey, I'm no prude, but this is NOT a film for young kids. It definitely deserves a PG-13. Yes, the darkness of the play has been lightened, but there are still themes of desperation and deception, there are hints of infidelity and its consequences (including death), and there are moments that are nothing less than sinister. Case in point: The Wolf (Johnny Depp in an extended cameo) isn't just creepy, he's also right on the edge of being lascivious. There's something very unsettling about his initial meeting with Red Riding Hood, during which he addresses her, hungrily (read that however you'd like), as "Miss Plump." And though there's plenty of light fluff in the first half, the second dips down into a spiral of misery for certain characters. For some young viewers, a few events will be upsetting. For others, depending on their level of maturity, there's a potential for a couple of scenes to be traumatizing. Into the Woods is not showing in any theaters in the area.